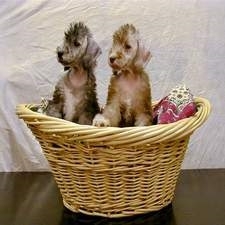 This Bedlington Terrier sold and went to a new family. CT / DNA and eyes (CERF). I am in good standing with AKC, and have won awards, set by them in the Bred by Exhibitor class & have acquired the Breeder of Merit award. Whether our pets are traveling the world with us, or just chilling on the couch, they are all, family members first. All our puppies have excellent temperaments. That’s because our puppies are all well socialized to make them better family members.